As the perfect first "big boy" or "big girl" bed, the Solid Wood Maxtrix Daybed is low to the ground and features standard rear and front guard rails. The front guard rail comes off as your child gets older. The Maxtrix Daybed is the building block bed that morphs into various Maxtrix loft bed and bunk bed configurations as your child gets older. The Maxtrix Day Bed is on display in our Long Island Showroom located a few blocks from the Roosevelt Field Mall and next to Pier 1. Optional under bed items include a trundle for sleepovers or a pair of 40" deep rolling storage drawers. 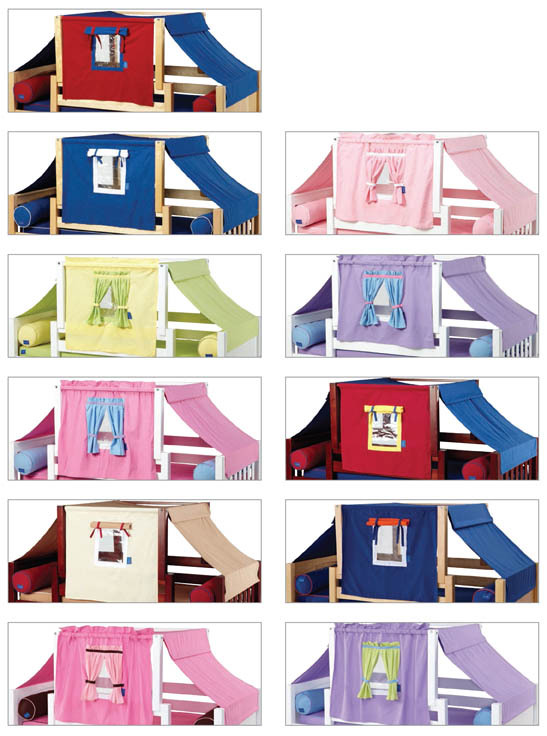 Add a top tent or a princess canopy, or a loft kit and slide to make this the most fun spot in the house. Tent & Curtain fabrics are available in different color combinations.